There's a new sheriff in town! Five characters from the Disney-Pixar Toy Story series. Woody, Rex, Bullseye, Slinky Dog, and Hamm transform and combine to form the giant figure! The die-cast metal Chogokin Woody Robo Sheriff Star stands about 9-inches tall. Woody and friends can combine? A totally wild, only-in-Japan re-envisioning of your favorite characters from the Disney-Pixar Toy Story series. 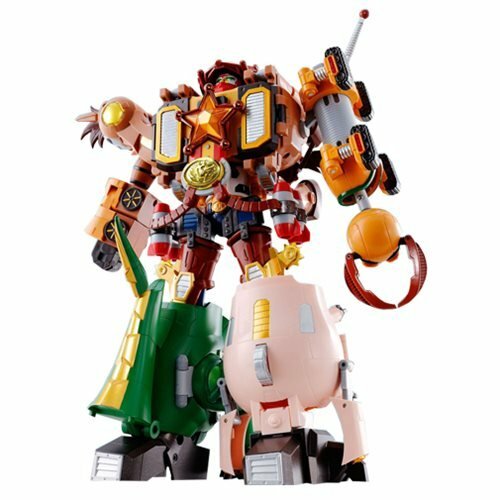 Woody, Rex, Bullseye, Slinky Dog, and Hamm transform and combine to form the giant 9-inch tall Toy Story Combination Woody Robo Sheriff Star Chogokin Die-Cast Metal Action Figure! Is that cool or what?! Ages 15 and up.